Learn more about implementing a customized recycling program for your business today. Increase revenue and refine your waste stream, all whilst making the environmentally sound decision. Recycling Services in Anaheim, CA. At Sunwest Metals, we take great pride in offering total metal recycling solutions for Southern California. We also provide a variety of programs and products that are designed to add value to local businesses and industry, including transportation and roll-off container services. At our facilities in Anaheim, we can meet all of our suppliers’ needs in an efficient, cost-effective manner. Contact Sunwest Metals today to learn more about our services. Here at Sunwest Metals Inc. we have the ability to tailor a recycling solution appropriate to your operation and location. 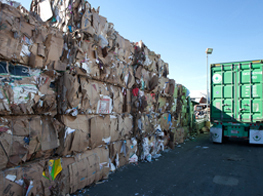 We have the equipment necessary to fit your needs and volume; roll-off containers of all sizes, compactors, and balers are all readily available to ensure a smooth recycling operation. Our company has the capacity to transport any job be it large or small. Our facilities are spacious and convenient, handling high volumes, so that the overall interaction with our sellers is smooth and efficient. Sunwest Metals Inc. has built a reputation for excellent customer service and reliability. We establish great communication with our clients and work diligently to meet their needs. Our employees are industry experts, active locally and nationally in associations, keeping up with the latest trends for your benefit. You can rely on our representatives to be courteous, knowledgeable and responsive. The number one priority is to serve the customer and provide efficient recycling solutions that meet your business needs.